Opera has been busily making browsers since 1994 and the company behind its main browser claims to have about a quarter of a billion users worldwide. By any measure it’s the longest surviving browser still in current use. Internet Explorer has been replaced with Edge; Chrome browser isn’t even a decade old; and Firefox launched in 2002. So respect where it’s due. Opera has also been innovating and responding to users’ needs. For example, in its latest version of its main browser it has included a VPN that anyone can use free of charge to circumvent tracking and tracing; it places great importance on ad blocking and privacy, too. But essentially, Opera browser is just another browser with all the features we’d expect of one: tabs, bookmarks, extensions and private windows – all presented in a nice box with a navigation bar at the top. The browser comes installed with a few popular bookmarks to give you the idea. So you’ve got The Verge, Facebook, Mashable and a few others (they’re obviously removable). The icons sit on the main page just like they do on your operating system, and as you become a more regular user, they will arrange themselves gravitationally, i.e. the most frequently used ones will appear at the top and the less used ones will presumably disappear into a black hole to join Netscape Navigator. At the top of the home screen is a search bar; you can change the engine in settings. When you click the icons the page loads. You’ll notice that a new icon appears in a column on the right; this is effectively where the tabs stack up. If you minimise a window is gets sucked into its tab icon ready to open again later and the desktop icons show again. Otherwise, clicking a tab will just open that page over the existing one. You can drag tabs onto your desktop to put them in your favourites. They seem to arrange in order (I probably haven’t built up enough browsing data for Neon to work out what I like the best, luckily). The problem with the tabs is that they quickly fill the column and don’t shrink or go two-thick; you just have to scroll the tabs, which isn’t very convenient. At the foot of the left column is Settings. A cool feature is the audio/visual player. 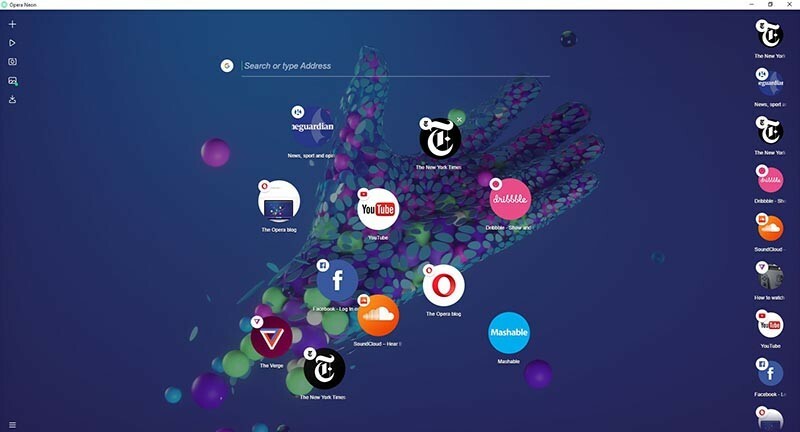 If Neon detects sound or video playing, you can click the button and it will turn it into a pop-up player that you can resize and move about, even outside the browser itself. I works quite beautifully too. If you’ve installed Neon, why not try it now? Copy and paste this URL into Neon, press play on the video below and click the pop-out icon in the Player icon on the left. 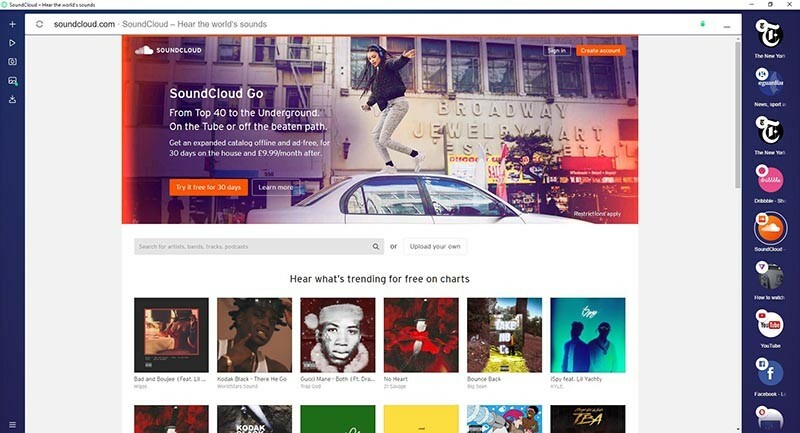 You’ll be able to move it to anywhere on the screen and carry on browsing the site. The screen grab is handy, letting you select an area of the page and take a snapshot of it. It’s an always-on feature that usually involves an extension installation on most browsers. If you grab a lot of images, it’ll be a welcome addition, but I’m not sure the average person takes enough snapshots to justify an always-on button taking up screen space, albeit a few pixels. The gallery simply displays all your captures. Maybe when you got used to it, it would become an invaluable form of scrapbooking. 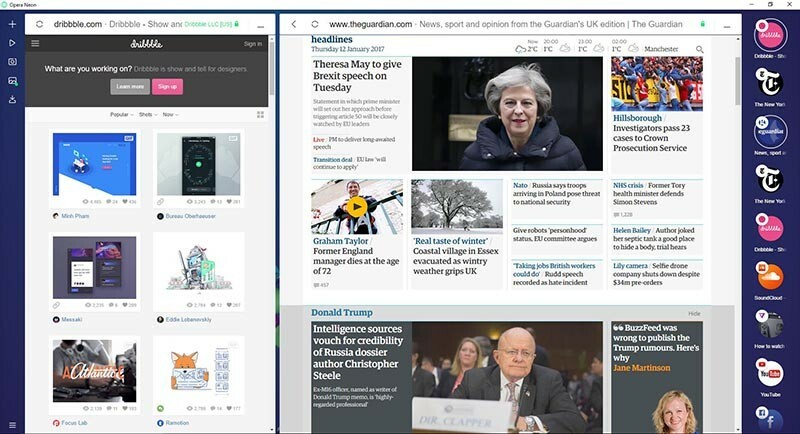 Want to look at two different windows without faffing around dragging browsers about? Simply drag one of your tabs into the top of the open browser window and the screen splits vertically. You can slide the join left or right to make one bigger than the other. It’s currently limited to two screens, but the concept certainly works. Close down one window and the other goes full screen. Maybe it’s because of the stripped-down nature of the browser, but it really is fast. There’s no noticeable loading time on the pretty average desktop PC and internet network we have here. I must admit I thought I was going to have to learn a new way of browsing when I read some of the reviews before installing Neon, but I picked it up in an instant. That’s both good (it’s certainly intuitive) and a tad disappointing, to be honest. To describe is as a radical departure from the traditional web browser is stretching the truth about what is essentially a normal browser turned 90 degrees so the tabs are down the right. Every opinion about Neon has to be given the caveat that it is just a concept and that natural selection should smooth out the rough edges like limited numbers of tabs and lack of features. In reality, the pretty icons on the browser’s desktop are really just the same as Chrome’s and Firefox’s “most visited” thumbnails or Vivaldi’s (and Opera’s) speed dial page, just arranged differently. In a way, the last thing web developers need is a completely radical rethink of the way we browse. Imagine if desktop and phone browsers suddenly became horribly unfashionable and everyone started using oval wristwatch displays or a monochrome head-up display to view our content. Sure, devs would have plenty of work converting every business’s website, but … come to think of it, there isn’t a downside. Users too need to be considered ever so slightly in the radicalisation of browsers. Intuitiveness is a good thing in any form of technology. It assists adoption and allows designers of applications to predict how users will interact with their products. So just as consumers have come to understand the grammar of the eCommerce page or the news page, the browser experience itself needs to change somewhat gradually to ensure take-up. Google Chrome took a leap of intuition with tabs, at a time when every page viewed simultaneously had to be a new instance of the browser. It was such an intuitive success that every browser now has tabs; they have entered the browser vernacular. Apart from the quite wonderful pop-out media player, there is no such fork in the road with Neon. It’s worth stressing again that Neon is a concept, and necessarily a work in progress. It’s great that someone is at least thinking radically about the way we use browsers. Perhaps browsers have already levelled off at a point of usability perfection like the spoon, the staircase, the wheel. Or perhaps there’s a change as “obvious” as the browser tab sitting undiscovered that will make us wonder why no one had already thought of it (like all the best inventions). I don’t think Neon has any of those yet, but if Opera is treating Neon as a sandbox to try new browsing concepts and analyse usage, then we should all be yelling for more … and, as developers and marketers, paying close attention.